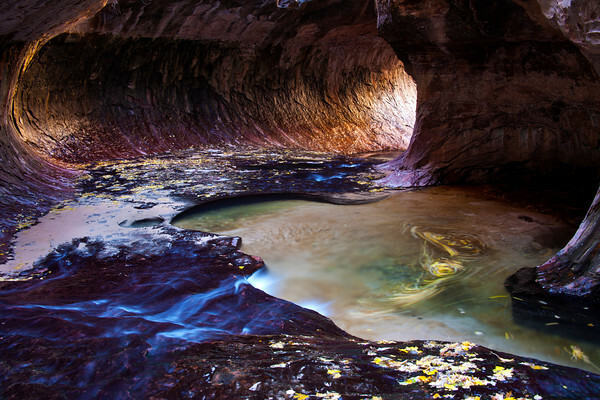 A 4.5 mile hike into the Left Fork of North Creek in Zion National Park you will arrive at this epic location known as "The Subway". When I first arrived at the Subway the light reflecting through the Subway was just starting to penetrate through...I was there for over an hour and the light grew stronger all the way to the left hand side. With the leaves circulating in the pool below and with a long exposure this image captures the moment. I still had to hike 4.5 miles back out of the canyon. This location has been on my bucket list for some time and I felt honored to finally see it in person. After an all day adventure and feeling totally exhausted, I thought that I have made my one trip to the Subway and would not return.